اویسی, حمیدرضا, محمودآبادی, محمدرضا, فضیلنی, جمشید. (1393). بررسی ناپایداری دینامیکی پنل های استوانه ای کامپوزیت چندلایه با کاربرد تئوری لایروایز مرتبه اول برشی و روش نوارمحدود اسپلاین. علوم و فناوری کامپوزیت, 1(1), 61-74. حمیدرضا اویسی; محمدرضا محمودآبادی; جمشید فضیلنی. "بررسی ناپایداری دینامیکی پنل های استوانه ای کامپوزیت چندلایه با کاربرد تئوری لایروایز مرتبه اول برشی و روش نوارمحدود اسپلاین". علوم و فناوری کامپوزیت, 1, 1, 1393, 61-74. اویسی, حمیدرضا, محمودآبادی, محمدرضا, فضیلنی, جمشید. (1393). 'بررسی ناپایداری دینامیکی پنل های استوانه ای کامپوزیت چندلایه با کاربرد تئوری لایروایز مرتبه اول برشی و روش نوارمحدود اسپلاین', علوم و فناوری کامپوزیت, 1(1), pp. 61-74. اویسی, حمیدرضا, محمودآبادی, محمدرضا, فضیلنی, جمشید. بررسی ناپایداری دینامیکی پنل های استوانه ای کامپوزیت چندلایه با کاربرد تئوری لایروایز مرتبه اول برشی و روش نوارمحدود اسپلاین. علوم و فناوری کامپوزیت, 1393; 1(1): 61-74. در این مقاله تئوری لایروایز صفحات ارائه شده توسط ردی ، به منظور تحلیل نا‌پایداری دینامیکی پنل‌های استوانه‌ای کامپوزیتی چندلایه ضخیم با استفاده از روش نوار محدود، مورد استفاده قرار خواهد گرفت. ناپایداری پارامتری، یکی از انواع ناپایداری تحت اثر نیروهای دینامیکی است که در آن نیروهای داخل صفحه اعمالی به سازه دارای تغییرات هارمونیک یا متناوب با زمان هستند. با فرض میدان جابه‌جایی مبتنی بر تئوری لایروایز شامل ترم‌های مرتبه اول برشی، روابط کرنش-تغییرمکان خطی و خصوصیات ماده ارتوتروپیک الاستیک خطی، اصل کار مجازی به منظور تحلیل عددی مدل نوار محدود مورد استفاده قرار گرفته است. به منظور ارائه میدان جابه‌جایی فرضی برای تحلیل معادلات حاکم، از روش نوار محدود اسپلاین مرتبه 3 استفاده می‌شود. مقادیر فرکانس‌های طبیعی و بار بحرانی کمانش پنل‌های استوانه‌ای کامپوزیت، با استفاده از فرمولاسیون ارائه شده محاسبه و مرزهای ناپایداری دینامیکی، با استفاده از تقریب مرتبه اول بولوتین استخراج شده است. نتایج ارائه شده شامل بررسی تاثیرات تغییر در شرایط مرزی، نوع لایه‌چینی، نسبت طول به ضخامت و انحنای پنل بوده و تاثیر این تغییرات بر مرزهای فرکانس ناپایداری دینامیکی، مورد تحقیق و مقایسه قرار گرفته است. Mahmoudabadi, M. R.: Finite strip analysis of parametric instability of laminated composite cylindrical shells with delaminations. MSc Thesis, Amirkabir University, Iran, 2014. V. V. e. Bolotin, "The Dynamic Stability of Elastic Systems. Volume 1," DTIC Document1962. Argento, A., and R. A. Scott. "Dynamic instability of layered anisotropic circular cylindrical shells, Part I: Theoretical development." (1993). Ng, T. Y., and K. Y. Lam. "Dynamic stability analysis of cross-ply laminated cylindrical shells using different thin shell theories." Acta mechanica 134.3-4 (1999): 147-167. Ng, T. Y., K. Y. Lam, and J. N. Reddy. "Dynamic stability of cylindrical panels with transverse shear effects." International Journal of solids and Structures 36.23 (1999): 3483-3496. Sahu, S. K., and P. K. Datta. "Parametric instability of doubly curved panels subjected to non-uniform harmonic loading." Journal of sound and vibration 240.1 (2001): 117-129. S. Wang and D. Dawe, "Dynamic instability of composite laminated rectangular plates and prismatic plate structures," Computer Methods in Applied Mechanics and Engineering, vol. 191, pp. 1791-1826, 2002. Fazilati, J., and H. R. Ovesy. "Dynamic instability analysis of composite laminated thin-walled structures using two versions of FSM." Composite Structures 92.9 (2010): 2060-2065. J. N. Reddy, Mechanics of Laminated Composite Plates and Shells: Theory and Analysis/JN Reddy: CRC press, 2004. E. Carrera, "Theories and finite elements for multilayered, anisotropic, composite plates and shells," Archives of Computational Methods in Engineering, vol. 9, pp. 87-140, 2002. Zhang, Yingshun, Simon Wang, and Björn Petersson. "Large deflection analysis of composite laminates." Journal of materials processing technology 138.1 (2003): 34-40. Zhang, Y., and S. Wang. "Buckling, post-buckling and delamination propagation in debonded composite laminates: Part 1: Theoretical development." Composite Structures 88.1 (2009): 121-130. Wang, S., and Y. Zhang. "Buckling, post-buckling and delamination propagation in debonded composite laminates Part 2: Numerical applications." Composite Structures 88.1 (2009): 131-146. Zhang, Xiuqin, Simon Wang, and Yingshun Zhang. "Stress and failure analysis of laminated composites based on layerwise B-spline finite strip method." Composite Structures 92.12 (2010): 3020-3030. Ćetković, M., and Dj Vuksanović. "Bending, free vibrations and buckling of laminated composite and sandwich plates using a layerwise displacement model." Composite Structures 88.2 (2009): 219-227. S. Srinivas, C. Joga Rao, and A. Rao, "An exact analysis for vibration of simply-supported homogeneous and laminated thick rectangular plates," Journal of sound and vibration, vol. 12, pp. 187-199, 1970. J. Reddy and N. Phan, "Stability and vibration of isotropic, orthotropic and laminated plates according to a higher-order shear deformation theory," Journal of Sound and Vibration, vol. 98, pp. 157-170, 1985. K. Cho, C. Bert, and A. Striz, "Free vibrations of laminated rectangular plates analyzed by higher order individual-layer theory," Journal of sound and vibration, vol. 145, pp. 429-442, 1991. W. Soedel, Vibrations of shells and plates: CRC Press, 2004. S. Wang and Y. Zhang, "Vibration analysis of rectangular composite laminated plates using layerwise B-spline finite strip method," Composite structures, vol. 68, pp. 349-358, 2005. A. Nosier, R. K. Kapania, and J. Reddy, "Free vibration analysis of laminated plates using a layerwise theory," AIAA journal, vol. 31, pp. 2335-2346, 1993. A. Messina and K. P. Soldatos, "Influence of edge boundary conditions on the free vibrations of cross-ply laminated circular cylindrical panels," The Journal of the Acoustical Society of America, vol. 106, p. 2608, 1999. A. Chakrabarti and A. H. Sheikh, "Buckling of laminated composite plates by a new element based on higher order shear deformation theory," Mechanics of Advanced Materials and Structures, vol. 10, pp. 303-317, 2003. H. Nguyen-Van, N. Mai-Duy, W. Karunasena, and T. Tran-Cong, "Buckling and vibration analysis of laminated composite plate/shell structures via a smoothed quadrilateral flat shell element with in-plane rotations," Computers & Structures, vol. 89, pp. 612-625, 2011. L. R. Kumar, P. Datta, and D. Prabhakara, "Tension buckling and dynamic stability behaviour of laminated composite doubly curved panels subjected to partial edge loading," Composite structures, vol. 60, pp. 171-181, 2003. M. Di Sciuva and E. Carrera, "Static buckling of moderately thick, anisotropic, laminated and sandwich cylindrical shell panels," AIAA journal, vol. 28, pp. 1782-1793, 1990. H. Matsunaga, "Vibration and stability of cross-ply laminated composite shallow shells subjected to in-plane stresses," Composite structures, vol. 78, pp. 377-391, 2007. Fazilati, J.: Higher order finite strip dynamic instability analysis of composite stiffened cylindrical panels having cutouts under parametric in-plane loads. 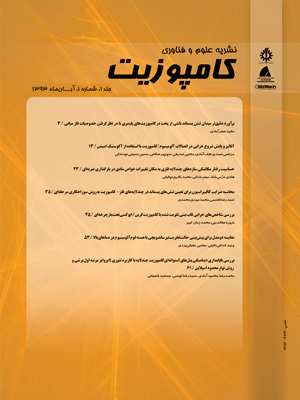 Phd Thesis, Amirkabir University, Iran, 2011.